The Gary Law Firm; Gary, Williams, Lewis & Watson, is known for taking on multi-million dollar cases seeking justice for its clients who have been victimized by large corporations. These cases have allowed the Gary Firm to obtain millions of dollars in high interest loans from lenders that specialize in litigation funding such as Law Finance Group. 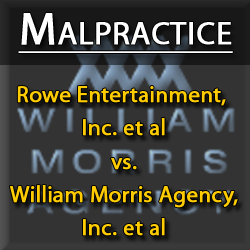 Future settlements in the firm's high profile cases such as Rowe Entertainment et al vs. 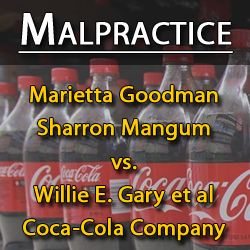 The William Morris Agency et al, a land mark civil rights and anti-trust case, and racial and gender discrimination cases against The Coca-Cola Company and Ford Motor Company, have often been used as collateral for these multi-million dollar loans. Upon information and belief, Gary and his law Firm concocted a scam to defraud their clients out of their settlement proceeds by cutting under the table deals with the defendants. This then enabled Gary and his law firm to avoid paying their creditors, because the loans that they had obtained were oftentimes collateralized by future settlements. By cutting these under the table deals with the defendants, there is no public record of any settlement and Gary et al walk away with millions. 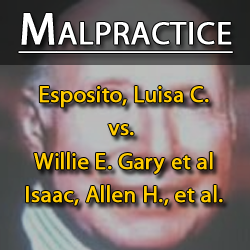 Willie Gary then privately and falsely explains to his clients why they need to drop their cases or face having to pay hefty legal fees, penalties or go to prison. With the plaintiffs feeling like they have no choice in the matter and trusting their attorney, in most cases, they opt to dismiss their case. This enables Gary to quietly walk away without paying anyone. This is the epitome of legal malpractice and fraud committed by some plaintiff attorneys. By engaging in this type of fraud, the Gary Law Firm is victimizing plaintiffs that have already endured emotional and physiological pain and suffering at the hands of companies. Plaintiff victims are defrauded out of their awarded compensation, while the loan companies are defrauded as well. 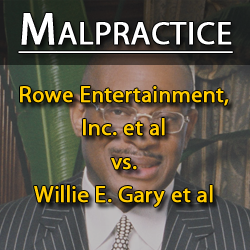 Why is Willie Gary or the Gary Law Firm still allowed to practice law anywhere in America? 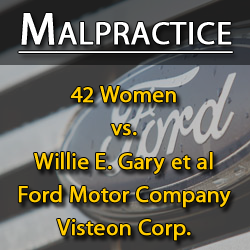 Florida plaintiffs' lawyer Willie Gary of Gary, Williams, Lewis & Watson is known for living a flashy life and for buying luxury cars and jets after winning big-money verdicts against companies like the Loewen Group and Walt Disney. But according to several suits filed against the self-proclaimed "giant killer" in the last two years, financial problems are mounting and his creditors are suing for default on millions of dollars in loans. Last week, U.S. District Judge David Hurd in Albany, New York, ruled that an affiliate of litigation funding company LawFinance Group may proceed with claims against Gary and one of his partners as guarantors of a $10 million high-interest loan made to their firm. 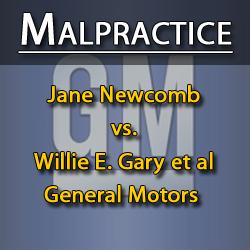 The decision marked the latest setback for Gary as LawFinance pursues fees his law firm is set to receive in at least two class actions. LawFinance is just one of a series of creditors demanding repayment from Gary and his firm in lawsuits and other actions that portray mounting liabilities. The Internal Revenue Service, for instance, has filed federal tax liens of more than $4 million against Gary since 2010, according to records with the Clerk of the Circuit Court in Martin County, Florida. Meanwhile, General Electric Capital has been pursuing Gary and his firm since May 2011 in federal court in Manhattan for defaulting on a 2000 loan to finance Gary's Boeing 737. Called "Wings of Justice II," the jet has a bedroom, full-service kitchen, leather seats and an 18-karat-gold sink, according to his firm's website. GE is seeking $3.59 million, following a default in 2009. In a reply brief in April, Gary's lawyers acknowledged that the firm had experienced "economic set-backs" before the default. In an interview Thursday, Gary said his firm has been through some difficult times. He said that since the recession, insurers that typically cover settlements with the defendants he sues have sought to pay out over a longer period of time, which delays his fees. But Gary also said that his firm fell heavily into debt during the boom times. He said he is now pushing his partners to pay down the debt and reach settlements with LawFinance and GE. "The last two to three years have been just tough economic times for the world, and our law firm is no exception," Gary said. "We've been working our butts off to weather the storm." Gary has fewer partners these days to help him batten down the hatches. At the start of 2011, the firm had 11 partners, according to a cached copy of its website. Today it lists just five. Business records show that the firm shortened its name in May, after former name partners Maria Sperando and Linnes Finney left. Another former partner, Manuel Socias, sued the firm on July 10 in Florida state court for failing to pay him $346,000. Socias declined to comment. Sperando said she left to start a solo practice and declined to comment on her former firm. Finney, who joined Greenspoon Marder earlier this year, did not respond to a call or email seeking comment. Gary acknowledged his firm has been shrinking. While he said many wanted to start their own practice, lower earnings from the firm could have factored into partners' decisions. "Sometimes that's reason enough to say I'm going to spread wings and do it my own," he said. The law firm's biggest creditor appears to be LawFinance, which says it regularly makes loans of $25,000 to $25 million to law firms. The company, represented by Scott Balber of Chadbourne & Parke, declined to comment on its litigation with Gary and his firm. According to a motion Gary's firm filed in October, it first turned to LawFinance in 2005, when it received a credit line to help finance contingency fee cases. A second credit line, established in 2007, carried sweeping rights for LawFinance, such as a lien on "substantially all" of the firm's property, including accounts receivable and attorneys fees in class actions, according to LawFinance's complaint. Gary and partner Lorenzo Williams also personally guaranteed the 2007 credit facility. LawFinance claims they agreed n ot to receive any fees from the firm until LawFinance had been paid back in full. The law firm contends that LawFinance "misstates" the terms of the loan. LawFinance charged interest rates of Libor plus 13 percent a year, and, under the agreement, if the law firm defaulted, it would owe another 5 percent on top of that. The firm h a s asserted in the LawFinance litigation that over the years it has paid the litigation financier more than $20 million. But LawFinance asserts that since at least July 2009, Gary's firm has been in default. The firm has also allegedly failed to provide "accurate and complete reporting" of its collateral and provided "materially misleading information regarding its payment of case costs and the status of the collateral securing its obligations," according to an amended complaint filed in October. Other settlements by Gary's firm also caught LawFinance's attention. In March 2011, New York agreed to pay $45 million to settle a race discrimination suit by a class of Hispanic and African-American civil service applicants. The firm and its co-counsel, Sussman & Watkins, were set to receive $11.25 million in fees. But after LawFinance and General Electric Capital asserted liens on the fees, Judge Hurd issued an order that puts the funds in escrow. Gary brought counterclaims against LawFinance, alleging that the letters the funder sent to Boies and other co-counsel had "possibly damaged" his firm's relationships and claiming that LawFinance's interest rates were usurious. Hurd nixed those counterclaims last week. He also allowed LawFinance to move forward with claims against Gary and Williams after finding they had waived their protections under California state law governing excessive interest rates. The letters to Boies and the rest were likewise "expressly permitted" and had not constituted interference with Gary's contractual relations with his co-counsel, Hurd wrote. Gary said he hopes to have the creditor litigation behind him soon. He expects to be able to keep his plane, though he said that given high gas prices, he doesn't plan to fly it. He's focused in the meantime on paying his bills, he said. "We have a lot of debt from the good times," he said. "I can guarantee we learned our lesson, that's for sure."